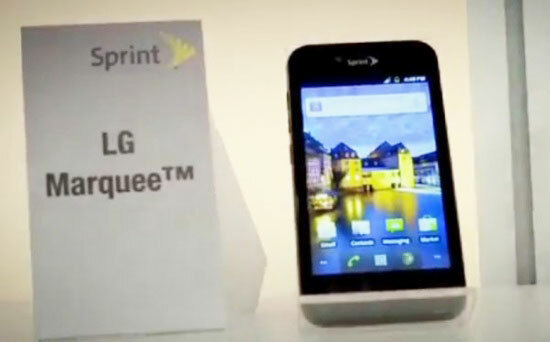 LG Marquee caught on candid camera, is this Sprint's Optimus Black? Is this a case of smartphone identity crisis, or just a repurposed chassis? Whatever the case may be, LG's got a Marquee handset ready to shore up Sprint's future line-up. The leaked shot comes courtesy of a now private video spotted by Android Central, and was taken at a Dallas-based Radio Shack Business Summit. It's evident from the one Mr. Blurrycam screen cap on display that the phone's currently running a vanilla build of Gingerbread, and sports a minimalistic design that's reminiscent of the Optimus Black. We can't be certain the two are indeed twins, however that leaked roadmap did indicate a stateside October bow for the Optimus Black -- this could simply be a rebrand for the Now Network.